Cliftonville's Chris Curran. Pic by PressEye Ltd.
Chris Curran is backing Cliftonville to show the character required to make a rapid recovery from Irish Cup disappointment towards European delight. Curran was skipper on Saturday during Cliftonville’s 3-1 defeat to Coleraine in the Irish Cup final showpiece. Ballymena United's Jim Ervin. Pic by Pacemaker. The frustration from that final setback had to give way soon after to focus on tonight’s Europa League play-off semi-final test with Ballymena United at Solitude. Linfield and Glentoran will also clash tonight as the four clubs fight it out for a spot in Saturday’s play-off final and the potential double prize of European qualification and a financial cash boost. “For large parts we played really well and tried to express ourselves with the style of football but it doesn’t count for too much at the moment,” said Curran following the weekend defeat. “But preparing for the play-off has already started in the changing room. “We already know there is a game that’s massive and in the aftermath of the final we will go away and think then focus on the next match. “It’s huge for the club this week so we don’t have too long to lick our wounds. “The lads have shown character so I’m sure we can get our minds and bodies right for the week. “The thing that hurts most is the backing from the fans all day was unbelievable so it’s hard not to be able to pay them back for that and the support all season. 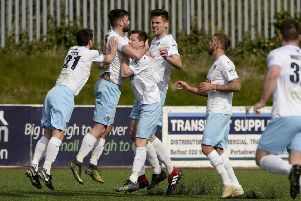 Ballymena United make the trip to Belfast having enjoyed a similar pathway into Europe last season that ended in play-off joy. “They are a good side and have plenty of firepower up front,” said United captain Jim Ervin. “But we are determined to make it through this match and keep our chances of playing in Europe alive. Kick-off will be 7.45 at both Solitude and Windsor Park. Fans are asked to arrive early at Windsor Park, with gates open from 6.30, due to expected delays as a result of Ed Sheeran’s concert at Boucher Road Playing Fields.